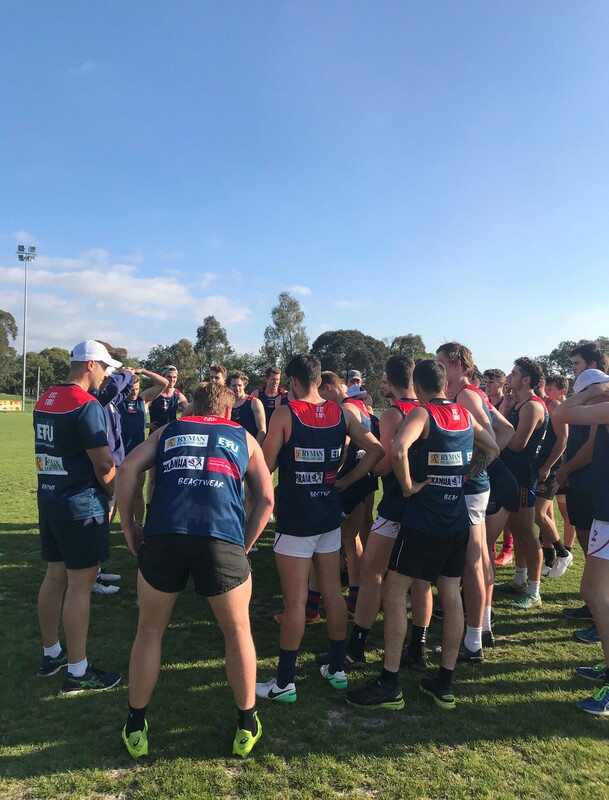 Coburg’s preseason is well and truly underway, having just completed its third week of the training program. Despite there being many new faces to replace those who decided to move on during the off-season, Assistant Coach Ben Osborne has been impressed by some of the returning players’ attitudes as they develop into leaders. “We’ve seen a lot of blokes already step up since those leaders have left; the guys have realized that they need to be the ones now,” Osborne said. Osborne noted the enthusiasm around the club, as the team continues to work hard right up until the Christmas holiday. “There’s no use holding back until after Christmas; we want our players to know the gameplan as well as they possibly can so we’ll be getting into some footy stuff and match-simulation very soon,” Osborne explained. 2018 joint Jim-Sullivan Medalist Marcus Lentini may be off the track in the rehab team, but looks forward to getting back out there very soon. Lentini enjoyed the preseason camp at Corowa, admitting it was a great chance to get to know some of the new additions, and has also noticed a positive feel among the playing group. “I don’t think those leaving will have any impact on the group; all the boys are really positive and we’re only going to go up from here,” he said. After a solid season with Old Trinity while being part of North Melbourne VFL”s program, new recruit Liam Whelan is also excited for next season. “The first couple of weeks here have been pretty good, the culture is great and the boys are great,” he said. Whelan wants to work on his fitness during the preseason, feeling it is the “point of [his] game where [he] really needs to step it up to keep at this level”. Latest signing Tom Simpson from Hurstbridge and Essendon VFL is another new Lion excited by the opportunity. “It’s been enjoyable getting around a new group, obviously it’s a bit difficult not knowing anyone coming in but it’s a good bunch of guys and a good coaching group,” Simpson said. Like Whelan, Simpson also wants to get a taste of VFL football, admitting “it’s been difficult cracking into it at an AFL/VFL club”. To see Marcus Lentini, Liam Whelan and Tom Simpson in action next year be sure to click here and sign up as a 2019 member today! Stay tuned for more news throughout the off season by subscribing to The Roar HERE, where you can get all the Exclusive News, and up to date information ahead of the 2019 season.